Our tree warden is Andrew Beeston and any enquiries about trees can be passed to him via our clerk using the "contact us" link at the side of this page. The Tree Warden Scheme is a national initiative to enable people to play an active role in conserving and enhancing their local trees and woods. The scheme was founded by the Tree Council and is co-ordinated by the Council with the support the government department Communities and Local Government. They have a website that can be seen by clicking here. Tree Wardens are volunteers, appointed by parish councils or other community organisations, who gather information about their local trees, get involved in local tree matters and encourage local practical projects to do with trees and woods. David Thornber is the co-ordinator for the Tree Wardens Scheme and he attended a recent parish council to promote the scheme particularly as Lathom South did not have any wardens at that time. He made it clear there is no prescribed "one size fits all" scheme, members can do as much or a little as they can. Volunteers will be most welcome, please contact the clerk if you are interested. The only sizeable woodland in Lathom South Parish seems to be Spa Roughs, and most other trees are to be found along the several brooks - Dungeon, Goose, Dicket's, Slate and Sefton presumably because there they don't interfere with our area's vital agriculture. There has been some new planting in hedges, eg along Whiteley's Lane: local farmers are to be commended for this work. There are currently 12 Tree Preservation Orders in force in the parish, some on individual trees, and others on groups or areas. The Parish Council with the Tree Warden are considering where additional trees might be planted and any suggestions from other people will be welcomed. If you have a favourite tree in the parish please let us know so that it can be included in a proposed map of parish trees and footpaths. 6 Arranged planting of new copper beeches in Dicks Lane to fill gaps with help (and at expense) of landowner. Ten trees from the scheme have been planted in a corner of the WLBC playing field to form a community orchard, four funded by Lathom South Parish Council, two plum trees were donated by a member of the local community and sixteen trees have also been planted in Lathom St James’ adjacent field with a few extra donated trees. It is hoped that there will be useful cross-pollination. Below is a picture of the orchard. Although the farm itself is located on School Lane Westhead, Andrew Holland farms over 90 acres of land, some of which lies within the Parish. He operates under an environmental and countryside stewardship scheme approved by Natural England. On his land a small area of woodland has been designated a biological heritage site, owing to its abundance of bluebells and ransom (wild garlic). The farm operates a RSPB tree sparrow project and in 2007 Andrew began a scheme of planting over 1000 metres of hedgerow, with daffodils alongside sections. managing a cultivated strip attracting wild flora and creating two pollen and nectar plots. Other projects include creating 2.5 acres of unharvested corn margins and 5 acres of wild bird mixes, providing winter food. Two barn owl boxes have been erected. He has recently obtained planning permission to create a wildlife pond at land near Mugs Cottage (off Dicks Lane). Nine species of birds on the RSPB red list are regularly seen on the farm and in the summer damselflies and dragonflies, along with a wide variety of butterflies, are present. As part of the schemes under which this programme is run, Andrew invites groups (up to about 15 at a time) of the public to visit the farm to learn about the countryside. Given that this is a working farm, visits are arranged for weekday evenings and weekends. These visits, (free to the group), may be for groups of school children or interested adults. Japanese Knotweed was first introduced to Britain by the Victorians as an ornamental plant - and was actually awarded a gold medal at a prestigious flower show. In its native countries of Japan, North China, Korea and Taiwan, the weed presents nowhere near the problem it now poses across Europe, America and New Zealand. With its natural habitat being on the slopes of volcanoes, it is no surprise that the less harsh and more fertile environment of Britain has allowed this plant to flourish to extreme proportions. Furthermore, outside of Asia, the plant has no natural biological enemies to check its spread. This plant is perennial and extremely invasive. It thrives on disturbance. The tiniest piece can re-grow, and has been spread by both natural means and by human activity. It soon overruns riverbanks, railway embankments, road verges, gardens and hedgerows, threatening the survival of other native plant species and in turn insects and other animal species. In wet areas, high water flows disperse fragments of the plant downstream where new colonies form. In the past, fly-tipping and transportation of soil containing rhizome fragments have been a major cause of spread, particularly in the urban environment. Green waste recycling schemes are also sites of potential contamination which is a cause for concern. Local Authorities, are desperate to find ways of eradicating this serious pest. Himalayan Balsam is a tall, beautiful plant from the Himalayas in Asia. Its large pink flowers can be seen along riverbanks across the United Kingdom as the species favours damp conditions. The species can spread rapidly and oust native species, reducing the ecological value of the land and leaving the soil vulnerable to erosion. Himalayan balsam was first introduced to the United Kingdom in the 1830s as an ornamental plant. It did not take long for thespecies to escape and start growing in the wild. Each plant can produce over 2000 seeds which are distributed by their exploding seed heads. The explosion can propel the seeds up to 5 metres, often into rivers and waterways which then further the distribution of the species. Himalayan balsam can grow tall and in dense clusters. By doing so it can prevent the smaller native plant species from growing as there is not enough light for them. This causes problems on riverbanks which are dependent on the root systems of the native species to provide stability. Without the native plants binding the soil with their roots, when the Himalayan balsam dies back in autumn the riverbanks are susceptible to erosion in periods of heavy rainfall. Chemical control: can use glyphosate or 2,4-D amine. Need to be used whilst plant is actively growing in early spring for best effect. greater seed production in any plants that regrow. Cutting should be repeated annually until no more growth occurs. Pulling: shallow-rooted plants can be pulled up very easily and disposed of by burning or composting, unless seeds are present. Under the Weeds Act 1959 the Secretary of State may serve an enforcement notice on the occupier of land on which injurious weeds are growing, requiring the occupier to take action to prevent the spread of injurious weeds. 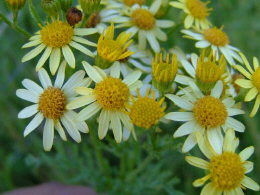 The Weeds Act specifies five injurious weeds: Common Ragwort, Spear Thistle, Creeping of Field Thistle, Broad leaved Dock and Curled Dock.